Biscuits are delicious. They are great eaten plain or with a dollop of butter, served smothered with most anything, and a great alternative to bread or bagels for a breakfast sandwich. The recipe below is a clean and healthy option. Enjoy! 1. Preheat oven to 450 degrees. In a large bowl, mix flour, sugar, baking powder, and salt. Add butter chunks to bowl. Use a potato masher or fork to cut in the butter until mixture forms into small crumbs. Stir in milk until dough leaves the sides of the bowl. The dough will be sticky and soft. 2. Place the dough on a lightly floured surface and knead gently 10 times. Roll until 1/2" thick. 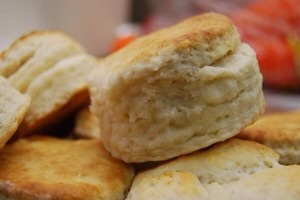 Cut with a 2" biscuit cutter or with the open side of a small cup. Place onto an ungreased baking sheet approximately 1/2" apart. 3. Bake biscuits 10-12 minutes until golden brown. Remove from baking sheet onto a cooling rack. Serve warm. Enjoy!